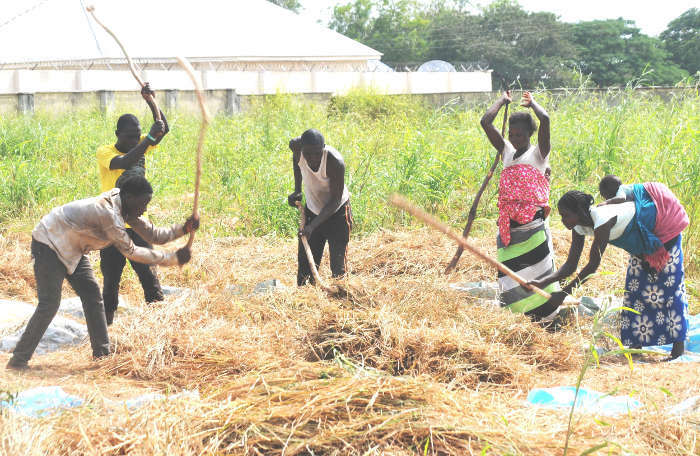 Wheat farmers raise alarm over potential drop in output – Royal Times of Nigeria. Wheat Farmers Association of Nigeria has raised alarm over likely decrease in wheat production due to inadequate government support and low pricing of the produce nationwide. The National President of the association, Alhaji Salim Muhammad, raised the alarm while speaking with newsmen in Kano on Wednesday. Muhammad, a member of the National Taskforce on Rice and Wheat, therefore appealed to the Federal Government to intervene in the matter especially as it concerned the cost of the produce as charged by millers. “There was a target by the government that by 2017, 2018, it would stop importation of rice. “By then, we are expected to have become self-sufficient in terms of production. “On the issue of wheat, we have taken some few years because it has been a neglected crop over the years. “I can tell you that we lost not less than N42 billion to import wheat into this country annually, when this country has the potential to produce enough wheat to feed the country and even have excess for exportation to other countries. “This year, we covered 300,000 hectares for wheat production in the country, but nothing came from the Federal Government as support during the production process on these 300,000 hectares of land. “We want the Federal Government to call us for a meeting so that we can review the MoU we signed last season so that we can agree on a new price because last year, we bought each bag of wheat seed at N40,000 per 100kg and now the millers are going behind us to buy a bag at N18,000. The News Agency of Nigeria (NAN) recalls that Wheat Farmers Association of Nigeria and Flour Millers Association of Nigeria in 2016 fixed the price of wheat at N140, 000 per tonne. The associations also signed a Memorandum of Understanding (MoU) to ensure that the millers bought all the wheat produced by farmers, hence creating the much needed ready market for the farmers. He appealed to the Federal Government to assist farmers through the provision of inputs such as improved wheat seeds and mechanised farming implements. Alhaji Farouk Rabiu, the Chairman of the All Farmers Association of Nigeria (AFAN) in Kano State, who described the current price of wheat as “oppressing’’, said as such, many farmers had been forced out of the wheat production business. According to him, if remedial steps are not taken, more and more farmers will stop producing wheat, which is capable of attracting huge foreign exchange for the country. Meanwhile, Dr Nasiru Gawuna, the Kano State Commissioner for Agriculture and Natural Resources, has appealed to Nigerian stakeholders in the pricing of wheat to address the issue in order to encourage more farmers in the country to produce wheat. “There is no way a farmer will produce and not make profit. We should be realistic in our decisions. “The Federal Ministry of Agriculture and Rural Development should urgently look into this pricing matter,’’ the commissioner said.